I find it easier to get rid of books if I’ve just read them, if they’re easily obtainable from the library or eBay (I tell myself if I want to read it again then I can quite easily) or if I can get free or cheap ebooks for my kindle. There are certainly many that I’ll never get rid of though. Good luck with the cull. Yes, we get emotionally attached to the ones we’ve had since we were young. I find I can’t get rid of my copy of Kafka’s Trial. There’s nothing brilliant about it, it’s just that I got it when I was 16/17 and it blew me away. Another ‘trick’ is scanning the cover as some I just kept because I liked the cover. Yes, that’s exactly it. The ones I read in those formative reading years are the ones I’m really glued to! Like the trick about the scans. Well done on both fronts! We’re in clear-out mode here too – six bags of books are lined up to go. Well done you too! It’s surprisingly satisfying and I feel I’m paring down things to the books I really love – which is nice! The problem with having a clear out is that sooner or later (most likely sooner in my case) it all has to be done again. I can’t remember who it was who said that he didn’t mind doing housework, it was having to redo a week later that he really objected to, but I know just how he felt. It’s what you do when you suddenly realise that book group is at your house this month! And then there’s the times when you have to re-buy a book you know you used to have… but I should not discourage culling! It is very laudable! Oh good finds. And I had a bookish de-clutter recently very necessary and it did feel good. It *does* feel surprisingly good, doesn’t it? Somehow, getting rid of books you’ll never read again does take a weight off! 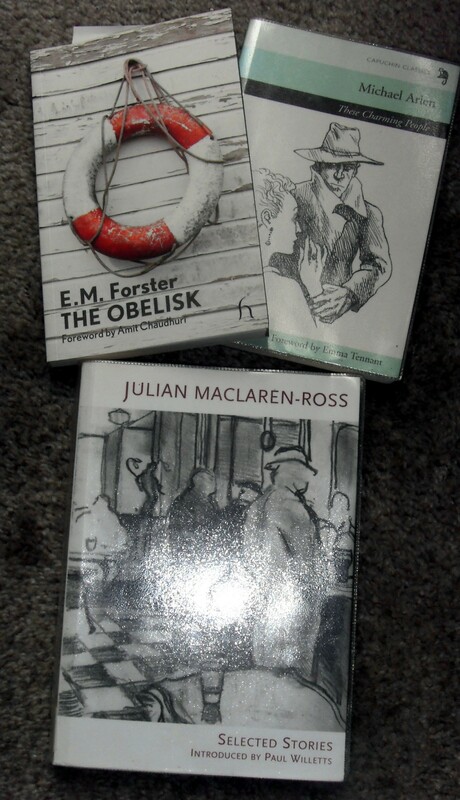 Lovely selection – three authors I’ve very much enjoyed, although I’ve not read any of those particular books. Well. you’ll be delighted to know that they’ve spurred me on to pick up “Of Love and Hunger” which is proving to be very wonderful so far!